AIA (Associazione Italiana di Anglistica) is pleased to announce its forthcoming Summer School, which will be held in Viareggio (not far from Pisa), a special place for the British romantics as Shelley’s dead body was burnt to ashes there and a monument and a square are dedicated to him. As you can see from the programme, there will be lectures by renowned international and Italian experts on Romanticism, and workshops for hands-on approach to the topic. 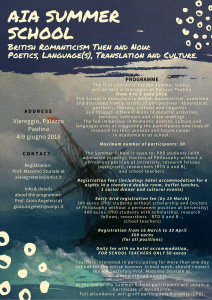 The Summer School will be paralleled by a “Festival Shelley” with evening talks and events meant for the community at large and the tourists in Viareggio. The Summer School fee is very low as we mainly want to attract PhD students, and we are looking forward to welcoming students from all over Europe.